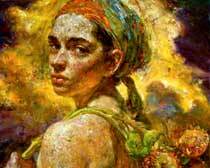 Figurative Artist slide show #1 is up! 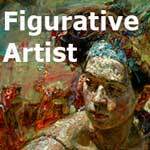 The figurative artist slide show #1 has finally gone live! If this movie doesn’t show at the correct size here on the page, click here to view it at YouTube. I had 176 submissions and had to edit them down to 132 to fit the music I had picked out and keep the video short enough to keep viewers’ attention. That means I have 44 slides already sized for slide show #2, terrific! Don’t be disappointed if yours got the cut as it’s in good company in the holding tank for a few more months until I get some new submissions from those who missed the boat this time around. 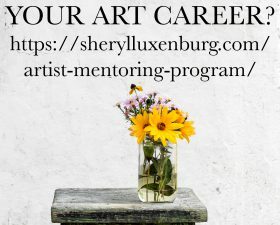 There is certainly something for everybody; exquisitely rendered oil paintings, bold chunky palette knife work, washy watercolor, mixed media, collage, sculpture in bronze, glass and ceramic, encaustic, photography, found objects assemblage and even an origami master. 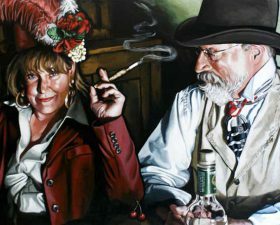 These fine artists and fine craftsmen have captured the human forms that fascinate them with passion, humor and sensitivity and offer you these clothed and unclothed subjects for your enjoyment. I hope you will enjoy this slide show and share it with your friends who enjoy the art of the human form. Before last October, all but around 40 of the over 500 artists who trust me to promote their images were complete strangers to me. The artists in this film come from USA, Canada, England, Sweden, France, Italy, Iceland, Holland and Australia. What an ambitious and instructional undertaking. It’s nice to be in the company of so many talented artists. Anyone just starting out in this wonderful field of art will be surprised how many different ways there are to depict the human figure. Hopefully, by viewing your slideshow, they will come up with yet another way by creating their own technique. Thanks again for including in this project. Paula, you did and amazing job!! I like it a lot. Ah Paula, this is brilliant. Thank you for compiling this. Many superb pieces of art and the music accompanied it beautifully. I’ll pass this link along. You may wish to put a social media widget on your blog so people can instantly facebook or twitter it. Great idea! I’ve added it to my 2 Blogger blogs, will try to figure out how to add to wordpress.com blog now. I love it! 🙂 Looking forward to the next one. Well done, Paula. I love the diversity of artists and makes me want to do some figurative work myself. Great job Paula, Thanks for including my painting! Just posted it to facebook. And will add it to my blog. Paula – I love the diversity, a really lively grouping! Paula, this is beautifully done. Congratulations! 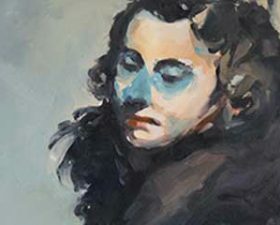 Thank you for all the time and work you’ve put into this project to make our work – the work of figurative artists – more visible and accessible. I missed the boat the first time around (have been traveling more than I want) but will do my best to make it into the next! Thanks everyone for your kind words. It’s hard to find the right balance of time, image, name placement, etc. I placed the name right on the image to make lifting the high res images harder and I went with more images and less time per image knowing that it’s too fast to read the name and see image at same time. I hope viewers will sit back and just watch the image flow first and then maybe take a 2nd run through and take note of a few names to look up. Don’t forget, you can hit the pause button at any time and spend time with one image. I look forward to our next show which promises to be just as good. Just AWESOME!! You did a fabulous job of placement,color and movement in the video! Thanks for including me in this terrific video collection and on your figurative web site. 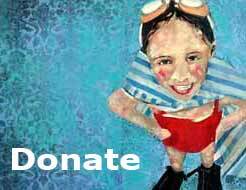 This is not just a tremendous resource for collectors, but for artists as well. I spent a good amount of time on the web site and subsequent artists sites. I must admit, I didn’t know many of these artists that are concentrating specifically on figurative work. It’s great to see what others are doing and I must admit that my latest painting was influenced by the work of another artist on the site. Isn’t that interesting, influenced by another in the group. I have found many of these artists through art magazines so they’re all out there trying to gain exposure. I really don’t search for new ones blindly online. I only research names from artists who have already captured my attention somehow. Really enjoyed this video and the standard of the work is very high. How can I join? I’m finally settled in Albuquerque and had a chance to look at the slide show. It’s really a fabulous collection and I’m honored to be included. Thank you for all your work and for living your life out loud and in color.